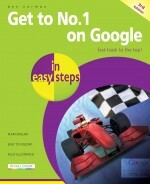 Now, in its third edition, Get to No.1 on Google in easy steps will show you how to get No.1 ranking on Google. It'll carefully walk you through the processes of marketing a website on Google. Regardless of your level of skill you will be able to make positive changes to your website enabling it to enter and climb to the top of the rankings of Google. This is essential information for all website owners as 1st page listings in Google are highly sought after. They are responsible for generating huge quantities of targeted traffic and revenue. This book contains specific information on how to identify the keywords being searched for, and how to identify niche markets with little or no competition. It then goes on to show how to implement the keywords into your website making it highly relevant. There is also extensive information on improving existing Google positions and keeping ahead of your competition. Ben Norman is one of the UK's leading SEO Consultants specialising in Google optimization. He also runs one of the UK's leading search engine marketing companies called Koozai. Ben Norman regularly commentates on the Internet Marketing Industry and has appeared in such places as Sky News, the BBC, Web Designer Magazine and .NET magazine, not to mention many digital articles and white papers that have been cited online. “Been reading and working my way through the advise given in the pages of this wonderfully written and illustrated collection of SEO knowledge since purchasing it a few months ago. I’m new to website SEO practices and this book has been a real eye opener. Before I purchased the book my first site had a few SEO methods implemented. Armed with the knowledge from this book, my second website has ten times the SEO methods implemented on it for higher Google ranking. It was easy to do and the tools recommended make it a breeze to check on my progress, as well as that of my competition, which by the way are not doing correct SEO practices. Even at today’s prices this book is worth it’s weight in Gold! Why I even bought two, one for me and one for a client of mine. They were second editions but still valuable. I’ll soon be purchasing two more of the new third editions! Keep Up The Good Work Mr. Norman!" "I bought this book two months ago and my business website now can be seen on page one of Google. I highly recommend this book to anyone who wishes to work on their own SEO. It's easy to read in plain english and enjoyable to learn the things that are placed out within it. The author does not try and pull the wool over anyone's eyes but instead you get truthful, reliable and to the point information which is so important for your online shop front. The people I network with around me are now asking about this book, after I show them the results. I now spent one day a week checking my SEO making sure it's content is being kept up to date and that I'm not missing out on anything. It's worth every penny." "... I have a copy of this book on my desk at all times, along with some other enormous technical tomes! I recommend this to everyone new to SEO (my whole team have read it) and actively try and force it on anyone else I work with who has anything to do with online marketing! At least one other person agrees with me as my last copy mysteriously vanished from the office... :o)"
Learn Google basics for free! However, they have recently removed the free version but there are other options throughout the book for all the Linkdex tasks.